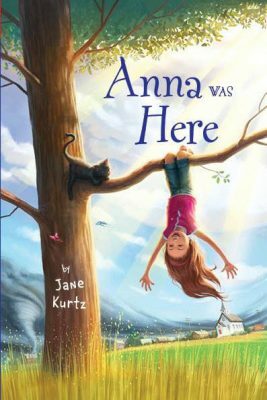 ANNA WAS HERE by Jane Kurtz (Greenwillow, 2013). Ten-year-old Anna Nickel is moving from Colorado to Kansas, and she is not happy about leaving her friends behind! This is a moving, often humorous coming-of-age story about family, faith, God’s love, and the meaning of home, perfect for fans of Katherine Paterson and The Penderwicks. Ten-year-old Anna Nickel’s worst nightmare has come true. Her father has decided to move the family back to Oakwood, Kansas—where he grew up—in order to become the minister of the church there. New friends, new school, a new community, and a family of strangers await, and what’s even worse, it’s all smack-dab in the middle of Tornado Alley. Anna has always prided herself on being prepared (she keeps a notebook on how to cope with disasters, from hurricanes to shark bites), but she’ll be tested in Oakwood! This beautifully written novel introduces a family who takes God’s teachings to heart while finding many occasions to laugh along the way, and an irrepressible and wholesome ten-year-old who, with a little help from Midnight H. (her cat), takes control of her destiny. Ages 8-up. More on this author from Cynsations. Compiled from promotional materials. BOOK UNCLE AND ME by Uma Krishnaswami, illustrated by Julianna Swaney (Groundwood, 2016). Every day, nine-year-old Yasmin borrows a book from Book Uncle, a retired teacher who has set up a free lending library next to her apartment building. But when the mayor tries to shut down the rickety bookstand, Yasmin has to take her nose out of her book and do something. But what can she do? The local elections are coming up but she’s just a kid. She can’t even vote! Still, Yasmin has friends — her best friend, Reeni, and Anil, who even has a black belt in karate. And she has grownup family and neighbors who, no matter how preoccupied they are, care about what goes on in their community. Then Yasmin remembers a story that Book Uncle selected for her. It’s an old story about a flock of doves trapped in a hunter’s net. The birds realize that if they all flap their wings at the same time, they can lift the net and fly to safety, where they seek the help of a friendly mole who chews a hole in the net and sets them free. And so the children get to work, launching a campaign to make sure the voices of the community are heard. 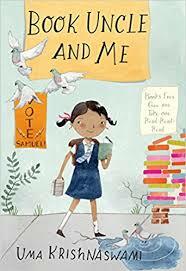 An energetic, funny and quirky story that explores the themes of community activism, friendship, and the love of books. Ages 8-up. More on this author from Cynsations. Compiled from promotional materials. CABIN IN THE SNOW (Book Two of the Prairie Sky Series) by Deborah Hopkinson, illustrated by Patrick Faricy (Aladdin, 2002). The story of Charlie’s trip into Lawrence with Papa. When Papa decides to help defend Lawrence from border ruffians, Charlie has to drive the wagon back to their claim and face a blizzard and a newborn baby alone. Each book includes an authentic recipe from the time. Ages 6-up. Recommendation by Frances Hill. DRAGONLING by Jackie French Koller (Minstrel, 2000). Darek’s initial ambition to become a hunter of dragons shifts when he befriends a dragoning and must bring it home. First in a series (all recommended). Perfect for the pre-Potter set. Ages 8-up. Look for sequels. I’M SORRY, ALMIRA ANN by Jane Kurtz (Holt, 1999). This historical chapter book takes young readers on the Oregon Trail with Sarah and Almira Ann. A story of friendship as well as a great curriculum bridge for teachers. Ages 8-up. INDIAN SHOES by Cynthia Leitich Smith (HarperCollins, 2002). Ray and Grampa Halfmoon face the challenges of daily life with love and humor in this collection of short stories set in Chicago and rural Oklahoma. Together, they encounter homesickness, bad hair cuts, mystery, artistic competition, and a wedding without proper pants. Ages 7-up. JUAN BOBO: FOUR FOLKTALES FROM PUERTO RICO (An I Can Read Book) by Carmen T. Bernier-Grand, illustrated by Ernesto Ramos Nieves (HarperCollins, 1994). Bright, festive illustrations accent charming, funny text. Ages 7-up. THE MAGNIFICENT MYA TIBBS by Crystal Allen (Balzer & Bray/ HarperCollins, 2016). Nine-year-old Mya Tibbs is boot-scootin’ excited for the best week of the whole school year—Spirit Week! She and her megapopular best friend, Naomi Jackson, even made a pinky promise to be Spirit Week partners so they can win the big prize: special VIP tickets to the Fall Festival! But when the partner picking goes horribly wrong, Mya gets paired with Mean Connie Tate—the biggest bully in school. And she can’t get out of it. Good gravy.Now Naomi is friend-ending mad at Mya for breaking a promise—even though Mya couldn’t help it—and everyone at school is calling Mya names. Can Mya work with Mean Connie to win the VIP tickets and get her best friend back? Ages 8-up. More from this author from Cynsations. Compiled from promotional materials. MINNIE SAVES THE DAY: THE ADVENTURES OF MINNIE by Melodye Benson Rosales (Little Brown, 2001). Dolls come to life in this new hardcover chapter book series with lovely color interior illustrations. A window to Chicago’s Bronzeville community in the 1930s. Ages 5-up. REGULAR GUY by Sarah Weeks (HarperCollins, 1999). Twelve-year old Guy is normal and relatively well-adjusted. His parents are weird beyond belief. So he decides he must have been switched at birth with the oddest kid at school. Then they try to prove it to their parents. Ages 8-up. WHAT THIS STORY NEEDS IS A PIG IN A WIG by Emma J. Virjan, illustrated by Emma J. Virjan. (HarperCollins, 2015). What this story needs is a pig in a wig, on a boat in a moat with a frog, a dog, and a goat on a log. . . .As a panda in a blouse, a skunk on a trunk, and more hop on board, it becomes clear that what this story really needs is a bigger boat! 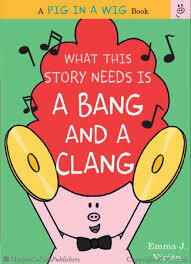 Join Pig on an exciting boat ride as she discovers that life is more fun with friends in this fantastic funny read-aloud with cumulative text. The “What This Story Needs…” books are bright and lively and inspire giggles. Other books in the series include: WHAT THIS STORY NEEDS IS A HUSH AND A SHUSH (HarperCollins, 2016) and WHAT THIS STORY NEEDS IS A MUNCH AND A CRUNCH (HarperCollins, 2016). Ages 4-up. More on this title from Cynsations. Compiled from promotional materials. THE WORLD ACCORDING TO KALEY by Dian Curtis Regan (Darby Creek, 2005). Mr. Serrano has asked Kaley to write essays about world history, and she’s filling her notebook with them–doodles and all. She’s including facts and footnotes and graphs and maps (okay, with maybe a little urging), and, more importantly, she’s including her unique and spirited interpretation of times past. Meanwhile, Kaley has a home to find for a puppy, adjust to her new baby brother (not sister! ), and deal with her messy cousin Cal. Smart, funny, vulnerable, and energetic, Kaley’s notebook is a first-rate read, and that’s a fact! Ages 9-up. More on this title from Cynsations.